Over the years, Sherry and I have developed a tradition of going to a local mall for lunch on Christmas Eve. The purpose? To simply watch the craziness of last minute shoppers. You see, it can be quite entertaining as long as you are not the one shopping. And yes, I am aware this is a little twisted. I mean, who goes out searching for joy in other peoples' frustration. Well, I guess I do. The plan was always the same. We would settle in for lunch or coffee someplace where we had a good vantage point and watch the madness. We would sip coffee, chat and laugh as we watched people pass us, in many cases multiple times, as they ran from one store to the next and back again. However, over the last few years it just hasn't been the same. So this year we decided it was time to try something new. We went to Union Square in San Francisco for a mini one night vacation on the last weekend before Christmas. It did not disappoint. Union Square bills itself as San Francisco's Most Famous Shopping District. And I would say that judging by the crowds, they are right. There were literally thousands of people in the Square. 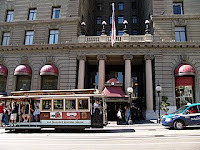 We found a great overnight package at the St. Francis Hotel, which is on Union Square. As we arrived, pedestrian traffic was so heavy that only one car at a time could make right turns with a green light. The St. Francis was so busy that cars checking in backed up onto Geary St and then onto Powell St creating the kind of gridlock you can only see in large cities. When we finally turned onto Geary Street, the garage was less then 100 yards away. It still took us over 30-minutes to get there. The SFPD actually started ticketing cars for obstructing traffic just after we pulled into the garage. Oh well, we were looking for craziness and we apparently found it. We get checked into a great third story room overlooking the corner of Powell and Geary streets. The crowds are immense. So we anxiously unpack and hit the streets. Once we were one with the crowd the magic started. It was a beautiful winter's night in the City and we decided to go to our favorite coffee house which is on the Square itself, Emporio Rulli. I was going to have an espresso and Sherry wanted hot chocolate. As I stood in line, Sherry had actually found us a table, I saw a sign for Venetian hot chocolate. So when it was my turn to order I had to inquire. I only needed to hear the words "intense chocolate" and "cream" when I immediately ordered 2 small cups. Then she asked what I believe is one of the silliest questions ever. "Do you want whip cream on those?" In my mind my response was something like "f-ing eh!" But in reality, my response was more like "Oh yes please. That would be lovely." We were lucky enough to get a table next to the ice rink were we sipped our Venetian hot chocolate, with whip cream, and watched people go around in circles. After spending quite a bit of time in a gallery talking about the works of Marc Chagall, it was time for dinner. We ate at Cafe de la Presse, a French bistro near the Square. It was a magnificent meal in all aspects. I was even able to pick up a L'Equipe, which is a sports newspaper from France. On the way back to the St Francis we did some shopping to walk off dinner and finally called it a night. On Sunday I slept in with Sherry (since there wasn't a ride I was trying to get to) and we spent a leisurely morning drinking coffee and reading. Sherry was quietly reading her book in bed while I was trying to work my way though L'Equipe. Afterwards it was more shopping. As it was still early and starting to rain there were not nearly as many people. Finally, we decided it was time to head home. So we packed, checked out and headed for the Golden Gate Bridge. Just as we pull out of the garage it started to rain quite hard. It seems our timing was perfect. Being on Union Square the weekend before Christmas was the perfect way to enjoy the seasonal holiday madness. And since we enjoy spending a couple of nights a year in The City we are already talking about doing this again next year. Until then, I hope eveyone is having a great holiday season.